Sign up to get email when registration next opens! Your privacy is safe with me, and I'll never share it with anyone. Please check your inbox to confirm your subscription to getting notified when Goddesses In You next opens. Do you love ancient mythologies and fairytales? After hundreds or even thousands of years, we're still telling these old tales because there's always a ring of truth in them about our shared human experience. Though their names sound foreign, the stories of the Greek Gods and Goddesses have always felt vaguely familiar to me. When I discovered a book titled "Goddesses in Every Woman" by Dr Jean Shine Bolen, I finally started to understand the connection. And I knew right away that I had to share with you! And what better way to honour the divine feminine than creating them in our art? The Birth of Venus (c.1486), detail. Tempera on canvas. 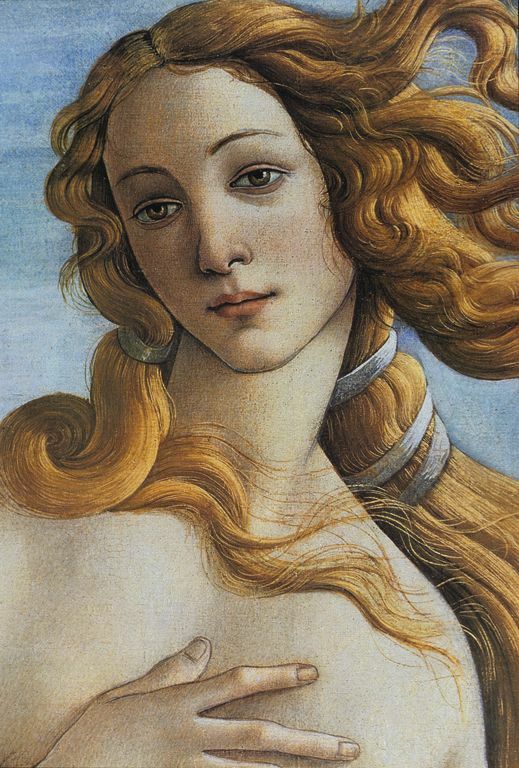 By Sandro Botticelli. These Goddess archetypes are personified powerful inner forces that influence you and me. From small day-to-day, to the bigger choices that can alter the course of our life. Once you become aware of these powerful influences, you acquire the self-knowledge about your unique strength, priorities, and abilities. And you will have confidence in your choices despite others' misunderstanding or disagreement. This process of self-discovery through art is empowering, enriching, enlightening, and nourishing to the soul. Goddesses In You will leave you with strong technical skills to start and finish creative paintings, and an in-depth reconnection with the divine feminine within yourself. Join me as we unravel the mystery and discover the Goddesses in You! This is much more than a painting class about techniques, though you'll learn heaps of that, too. We will dive into the psychology, meaning, and value each goddess archetype represents as we work through the art projects. Practice drawing the human head to understand proportions. In our first project, we will call upon Artemis (aka Diana by the Romans), the Goddess of the Moon and Divine Huntress. We will see how this archetypal energy is relevant in every woman who values independence, personal meaning, as well as sisterhood and spending time in nature. We will channel her influence to help us stay focused on what we choose to pursue (hint: if you have a goal, announce it to her). As the Goddess of Grain and Harvest, Demeter represents the Mother, and she is the most nurturing of all goddesses. As the Goddess of Love and Beauty, Aphrodite (aka Venus by the Romans) governs women's enjoyment of love and beauty, sexuality and sensuality, and she also drives our desire to create, both in life and in the arts. This will be a surprise for you. It's about the Goddess In You. If you want to use art making as a self-discovery tool, to reconnect with the Divine Feminine within you at a deeper level, this class is for you. Beginners will learn the various ways of image transfer, even skipping the drawing part if prefered, and start painting. More experienced artists will find this course inspiring, enlightening, and fun, especially if you love mythologies and want to create meaningful and symbolic art that is inspired by the truth told in these stories. This class is also perfect for artists who want to try or transition into oil painting, although all projects can be done in other medium such as acrylics. The concepts of art creation, such as color, composition, symbolism, concept development and etc. are applicable regardless of medium used. Please use what you have! If you want to work in acrylic or mixed media, by all means, you do not need to get new oil paints. That is, of course, unless you want to start painting in oil, like I do in all the projects. You do NOT need all the supplies and colors I list here. These are the ones I have used in the projects, and the more important ones are marked. three substrates of your choice (stretched canvas, panels, or boards) *, two of which in the proportion of 1:2, such as 12"x24" or 8"x16"
Computer or mobile device with broadband internet to read the course content and watch the video tutorials. And some art supplies from the list above. This is designed to be a four week course, with one new Goddess project each week, and the last week being the bonus project week. The course content for the week will be released every Tuesday for four weeks. You will use your password to login to the classroom to access the content. It is designed this way so you can focus (channeling the Artemis energy here) and don't waste time slipping through and feeling undecided on what project to do first. Yes. You will have lifetime access to the class, and all videos are downloadable. If your question is not answered here, feel free to email me via this link. DO I HAVE TO "BELIEVE IN SOMETHING" TO TAKE THE CLASS? No, not at all. Far from mystical or stereotypes, the goddesses represent the whole spectrum of our human consciousness and psychological patterns. Their stories reflect back to us who we are, and offer insights into our choices and solutions to our problems. DO I HAVE TO USE OIL PAINT FOR THIS COURSE? Not necessarily. You can use acrylic or mixed media for all the projects, and interpret the themes your way. But if you're interested in oils, this class will help you get started even if you've never painted with this medium before. CAN I SELL PAINTINGS MADE FROM THIS COURSE? Yes, absolutely! As an artist, I know how great it feels when someone loves your art so much that they not only compliments but also cash. If you would give credit to this class and me, that would be great. Yes. We'll have a private (and optional) Facebook Group for the course where you can share and support each other.